Indulge along the stunning Amalfi Coast, with a stay at the Miramalfi Hotel. Nestled along pine-cladded cliffs and adorned in striking bougainvillea, this luxurious hotel overlooks the sparkling azure vista of the Tyrrhenian Sea, even offering steps directly into the warm waters. 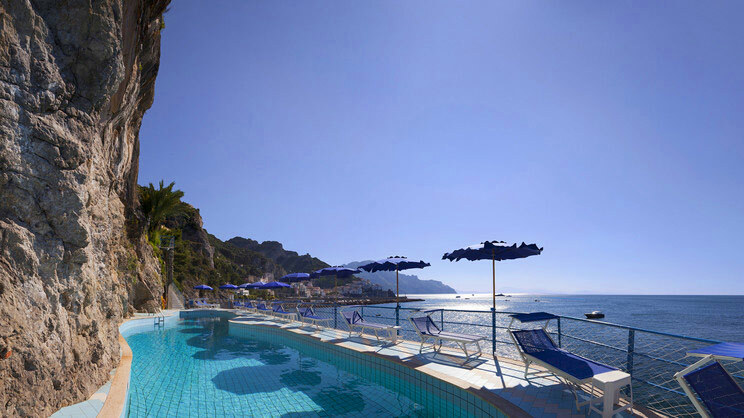 With all of the onsite facilities you could possibly need including a restaurant and serene swimming pool, the Miramalfi Hotel will also assist you in discovering the world renowned area of the Neapolitan Riviera. The hotel is located on the waterfront overlooking the stunning Tyrrhenian sea, with direct access to the crystalline waters. The hotel is only a short stroll from the main Piazza of Amalfi. Naples International Airport is approximately 75km away from the Miramalfi Hotel.